Home » WOD Blog » Practice, practice, practice. LA Sports Massage will be here from 4:30-8:30pm today giving free 10 minute massages! 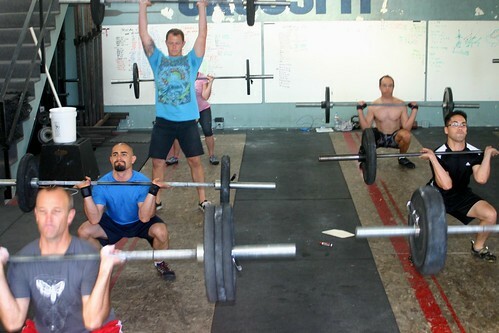 5×2, 2×1 Back squat, rest 2 minutes between sets. Notes: The weight will ideally stay the same for all sets. The prescribed weight is 100% of your 3RM back squat weight, scale as needed. “We’ve been making the case for years that athletes need to pay attention to how they perform some of the “less” complex or ”less” difficult movements in their training. Otherwise, it is really easy to accidentally and deeply groove some pretty wonky movement patterning that will rear its ugly head during more complex, or heavily loaded movements. Take the innocuous double under for example. Without thinking about it, an athlete can easily groove a few hundred reps of some really bad jumping and landing, or some weird bouncing-piking hip thrust (BPHT- btw, tm) in a matter of minutes. Again, congrats on getting your double under, too bad you’ve wrecked your ability to ever really effectively jump, or open your hips violently. Practice doesn’t make perfect, practice makes permanent. Ask any olympic lifting coach how easy it is to get an athlete to stop donkey kicking their feet during transitions. They will laugh.